BentoLunch.net - What's for lunch at our house: Monday's lunch with groceries again! Monday's lunch with groceries again! This weekend, I finally remembered that we have been out of cucumbers forever. And that we were low on melons. And grapes. And cookies. So I bought all those things. Faith had cucumber flowers, carrot sticks, grapes & melon, vanilla yogurt, some heart sandwiches (and one bear) and a couple of cookies. My slightly weird child ate everything but the cookies. I love that! 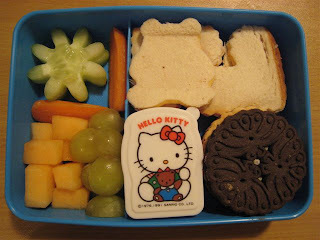 I am new to the whole Bento Lunches but LOVE the idea for my 6 yr old daughter. Can you tell me where your purchasing your bento boxes at? I live in the Arlington Texas area but would come to Dallas to shop if the items are there. I'm looking for the Hello Kitty ones. Back in the fall, the Dollar Trees had a ton of boxes with Hello Kitty on them--blue, green & pink with a couple of different styles. The Hello Kitty face shaped box I ordered on Ebay from Japan. Some of the Oriental groceries may sell them as well, I've bought cute boxes there before. There are a couple in Plano, but I would assume there should be some in Arlington too? I just don't know the area well enough to be positive.